Being in the South Ionian islands this route is generally very sheltered. You wouldn't want to spill that G'n'T after all... This said, a couple of days sailing down the Ithaka channel offers some great wind for sailing enthusiasts, with no significant swell. During the week you will visit places such as Fiskardo, Euphemia, Sami and Poros on Kefalonia Island, as well as our favourite spots on Ithaka Island. There is plenty of time for swimming and exploring on this cruise as well as wandering around the back streets of the villages. There may also be time to visit the smaller islands of Kastos, Kalamos or Meganisi, which all offer a real chance to get away from it all, after the bustling villages of Kefalonia island. The Kefalonia route starts and finishes in Euphemia on Kefalonia Island and explores many picturesque spots on Kefalonia and Ithaka. Once you have arrived and met your lead crew it is time to relax and soak up the sun and the atmosphere of the quayside tavernas, before the first days briefing the following morning. 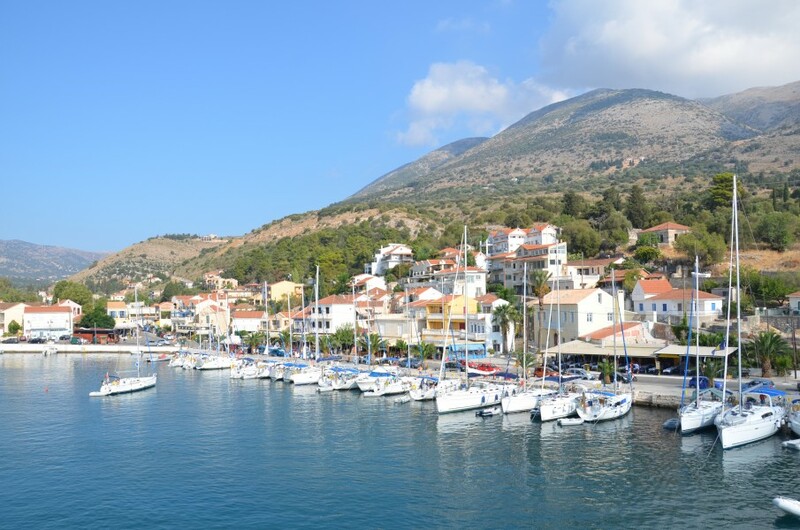 During the first few days you will visit places such as Fiskardo, Sami and Poros on Kefalonia Island. Scenic Fiskardo is a highlight of the trip, with its colourful character and eclectic evening promenade. From here you can also walk or take the dinghy around to the caves in Foci Bay which are well worth a visit. Sailing south to Sami & Poros means some excellent sailing in the Ithaka channel – making this route ideal for new, as well as confident flotilla sailors and their families. The next few days will be spent visiting Ithaka island and the fishing villages of Frikes and Kioni. Another of our favourite anchorages is Pere Pigadhi, where the crystal clear water will make you impatient to jump off the boat for a swim! 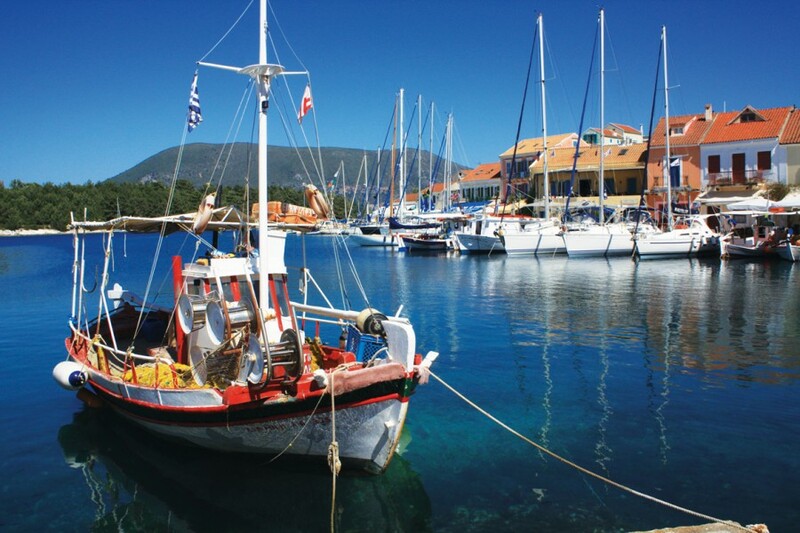 The flotilla sometimes stops at the main town of Vathi on Ithaka for a taste of ancient mythology. 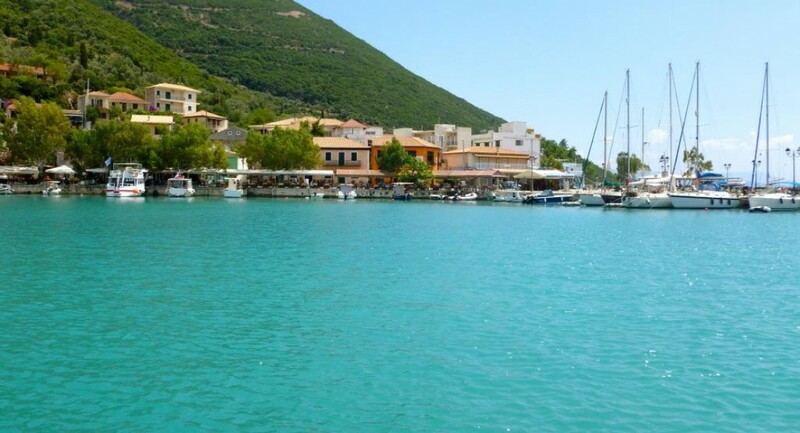 Another great spot you may visit is Vasiliki on the south western corner of Lefkas Island. Vasiliki is well known as the windsurfing and dinghy sailing mecca of Europe. The bay is stunning and has a plethora of shops, tavernas and cafes to explore en route to the long pebbly beach. From here you can rent windsurf equipment, paddle boards and dinghies, or simply relax on the beach. The final night stop will be back at the Kefalonia base in Euphemia for your final group meal with all your fellow flotilla sailors to reminisce on your wonderful trip! The final Saturday will be spent heading home - fingers crossed you'll be lucky enough to be back next year! Just got back from a week around Kefalonia with Phoebe, Chris and Connor, and wanted to say what a great time we had. Lead crew were absolutely superb - many thanks to them for going above and beyond, and kudos for delivering a fantastic experience. We'll be back! Sailing Holidays is superbly customer orientated. Their staff are very competent, friendly, relaxed and invariably helpful. They could not do any better. They provide an excellent opportunity for sailors - from novice to experienced - to enjoy a super holiday in sunny and beautiful surroundings. Thoroughly recommended - after nearly 20 years of returning to them. Very good value for the experience enjoyed. We had a fantastic time. With limited experience, the crew really helped and encouraged us - always at hand with expertise advice and help. We enjoyed it so much that we have signed up for another flotilla next year - this time Paxos bound! The six people on our Oceanis 393 "Ermioni" really enjoyed the holiday and the facilities were excellent. Tyson (lead skipper) Adam (engineer) and Phoebe (hostie) were all excellent representatives for your company. They were all pleasant, knowledgeable, and always available to assist in any way required. The whole experience was great and very relaxing. Charlie, Freya & Jesse were brilliant! They were all very professional & informative when required. Also very calming for a nervous novice skipper and I gained huge amounts of confidence with their encouraging assurances. Nothing was too much trouble for any of them & we all felt very safe & relaxed knowing they weren't too far away. But to top it all, they were great fun & we really enjoyed their company (being inspired to create the 'Charlie mooring' dance - Lol). They certainly made our holiday! you never do anything in particular; and when you've done it there's always something else to do - but IN THE SUN! Just back from another brilliant sailing holiday. The new Beneteau 38's are amazing! We all had a fantastic times and are certain to go again. Just spent a fantastic week with your guys Ali Cookie and Jordy down in the South Ionian. Had a fab time and the lead crew were really great-nothing too formal but engaged with their clients. Thanks to all three of them for making it a memorable holiday!! Thank you for letting us rookies loose on one of your expensive boats and please also pass on thanks to our lead boat crew (Athina - with Ali, Jordi and Cookie) for showing us the ropes and being "lovely". We all thoroughly enjoyed it. We have just returned from a very memorable holiday onboard Kalokeri in the Ionian, and would like to point out that we received fantastic help and hospitality from the lead crew (Al,Jordan and Cookie) from start to finish of our week in Greece. They really looked after us and the rest of the flotilla very well and our whole crew of seven cannot speak highly enough of them. Thanks to their hospitality and the help of the rest of the sailing holiday team we will definately be over in Greece again and will make a point of using Sailing Holidays Ltd. We were looked after from the moment we arrived in the airport to the moment our bags were checked in on the way out. Certainly one of the most memorable holidays ever, and we are looking forward already to doing it again in the not too distant future. This was our second flotilla holiday and we both thought that after the first one with Sailing Holidays and having such a good experience that maybe we were expecting too much to try to have a repeat it. However I'm pleased to report we had such a good time, met some lovely people and brought back some great memories also. We both look forward to more good sailing times in the future. We just finished our week long flotilla with Ali, Jordan and Jennifer (cookie). It was so amazing and we loved it! What made our trip so good was the friendliness of them all. They were amazing! They were all so funny and SOOO nice. We are still on holiday in Greece but last week were on the one week Kephalonia flotilla with you. I just wanted to drop you a line to thank you for a wonderful week. The organisation from the shore based crew was superb and the lead crew were outstanding. We will definitely return next year! What a fabulous time - we all loved it and the kids have told us to do it again asap! What can we say? You did warn us in the promotional video! We are hooked and are already contemplating where to go next year!!! It was one of the best holidays I have been on! The lead crew made a big effort to look after the kids and I'd like to send a big THANK YOU to them all. I hope to sail with sailing holidays in 2014 and one day be as good a hostee as Cookie. We had a whale of a time and I must thank you for making it possible. I've just come back from my first sailing holiday yesterday and I was amazed! It's not like anything I've done before but it was the best holiday I've ever had. I would drop you a line to express my gratitude for such a wonderful holiday! Thank you all - I am hoping to re-book for later in the season. I had arranged for a skipper for part of the week to do some sail training, we had previously been on a sailing holiday however due to my husband not being able to attend the holiday we needed someone with some experience to start us off. Nick was our designated skipper and I am emailing to say how impressed we were with him. There were three of us on our boat including my 12 year old daughter, Nick had us all comfortably helming by just the second day. After three days we were all gaining so much experience and having such a good time we decided to ask if he could stay on for the week. We all intend to book again for next year as we had such an amazing time. 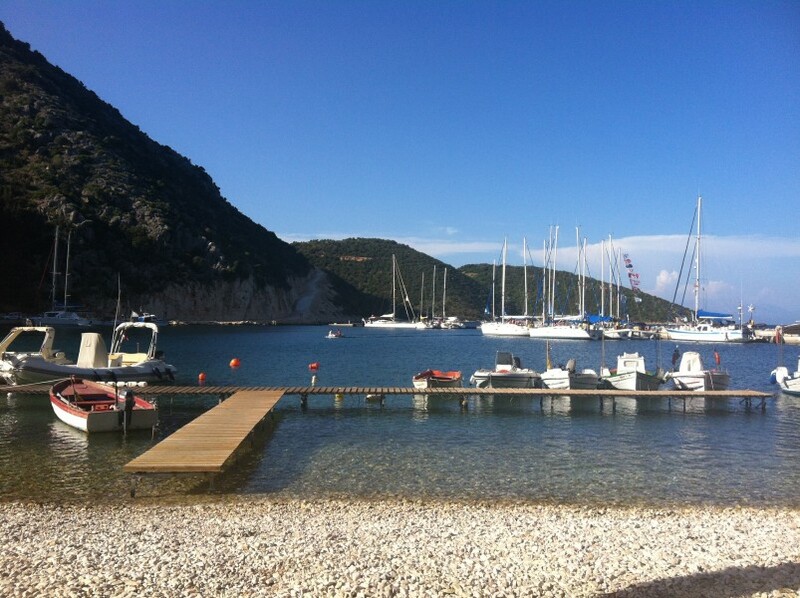 Follow Sailing Holidays Ltd's board South Ionian on Pinterest.